Congratulations! You’ve reached the ultimate resource about RFM analysis on the internet. Most other articles you’d find on Google about RFM analysis are either too shallow or too complex. On this page you will learn everything you need to learn about RFM. Along with the basics, you will also learn how you can apply RFM model in your own business. RFM (Recency, Frequency, Monetary) analysis is a proven marketing model for behavior based customer segmentation. It groups customers based on their transaction history – how recently, how often and how much did they buy. RFM helps divide customers into various categories or clusters to identify customers who are more likely to respond to promotions and also for future personalization services. Valuing customers based on a single parameter is insufficient. For example, you can say that people who spend the most are your best customers. Most of us agree and think the same. But wait! What if they purchased only once? Or a very long time ago? What if they are no longer using your product? So..can they still be considered your best customers? Probably not. Judging customer value on just one aspect will give you an inaccurate report of your customer base and their lifetime value. As you can gauge, RFM analysis is a handy method to find your best customers, understand their behavior and then run targeted email / marketing campaigns to increase sales, satisfaction and customer lifetime value. That’s why, RFM model combines three different customer attributes to rank customers. If they bought in recent past, they get higher points. If they bought many times, they get higher score. And if they spent bigger, they get more points. Combine these three scores to create the RFM score. Finally you can segment your customer database into different groups based on this Recency – Frequency – Monetary score. You can create different types of customer segments with RFM analysis, but here are 11 segments we recommend. Think about what percentage of your existing customers would be in each of these segments. And evaluate how effective the recommended marketing action can be for your business. Potential Loyalist Recent customers, but spent a good amount and bought more than once. Offer membership / loyalty program, recommend other products. Hibernating Last purchase was long back, low spenders and low number of orders. Offer other relevant products and special discounts. Recreate brand value. Carol has put up the perfect email newsletter – content, design, subject line, call to action, social media links… She sends out the newsletter expecting stellar conversion rates. Her mental math reasons that even if it converts at a “low” 10% rate on her 3500 customers, she’d be richer by a few thousand dollars within hours. Ten minutes.. half hour.. two hours..8 hours pass. But at the end of the day, it’s only 1.5% people who clicked the link and a single sale. What did she miss out? Carol did everything perfectly, except one – targeting. She sent the same email to everyone. I’m sure you’d agree: different customers react to different messaging. A price sensitive customer will grab a discount offer, but someone who regularly buys from you may get excited only about a new product launch. Instead of reaching out to 100% of your audience, you need to identify and target only specific customer groups that will turn out to be most profitable for your business. Most of us are not even close to Carol. Whether you are in online commerce, retail, direct marketing or B2B – most of us are so busy with daily chores that we don’t spend enough time on marketing. Our marketing campaigns are hurried, fall short on copywriting, lack professional design, and we don’t pay enough attention to tracking or improving conversions. Of course, we wish to do all of that. But we don’t. What if we understood our customers a little better and sent them more relevant campaigns? I promise our success rate will be much higher. Not only will we make more money, but our customers will also be happier and loyal. Still not convinced yet? You will be in a few minutes. Sending a message tailored to the customer group will generate much higher conversions. All marketing campaigns should pick up a target segment first, then create promotional material that will resonate with that audience, and then put the pedal to the metal. Unfortunately, most of us don’t do that. That is where RFM Analysis is super useful. RFM makes identifying customer groups easy. RFM considers recency, frequency and monetary values for each customer. Combines them, and then groups them into different customer segments for easy recall and campaign targeting. RFM analysis is super useful in understanding responsiveness of your customers and for segmentation driven database marketing. Who has the potential to be converted in more profitable customers? Which customers you must retain? RFM has a track record of decades. It’s not a fad or a marketing gimmick. It’s a scientifically proven process. First of all, it’s based on the Pareto Principle – commonly referred to as the 80-20 rule. 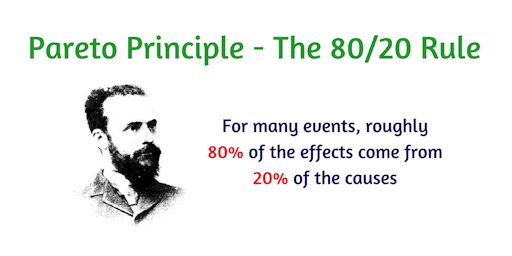 Pareto’s rule says 80% of the results come from 20% of the causes. People who spent once are more likely to spend again. People who make big ticket purchases are more likely to repeat them. Pareto Principle is at the core of RFM model. Focusing your efforts on critical segments of customers is likely to give you much higher return on investment! The concept of RFM was originally introduced by Bult and Wansbeek in 1995. It was used effectively by catalog marketers to minimize their printing and shipping costs while maximizing returns. Rising popularity of computerization made it even easier to perform RFM studies because customer and purchase records were digitized. An extensive study by Blattberg et al. in 2008 proved RFM’s effectiveness when applied to marketing databases. Numerous other academic studies have also approved that RFM reduces marketing costs and increases returns. I hope you are now convinced about the usefulness of RFM analysis for your own business. Now let’s get on the math behind all those results. Recency (R) as days since last purchase: How many days ago was their last purchase? Deduct most recent purchase date from today to calculate the recency value. 1 day ago? 14 days ago? 500 days ago? Frequency (F) as total number of transactions: How many times has the customer purchased from our store? For example, if someone placed 10 orders over a period of time, their frequency is 10. Monetary (M) as total money spent: How many $$ (or whatever is your currency of calculation) has this customer spent? Again limit to last two years – or take all time. Simply total up the money from all transactions to get the M value. Consider customer Robert Johnson – he last ordered 3 days ago and placed a total of 6 orders worth $540 till date. Once we have RFM values from the purchase history, we assign a score from one to five to recency, frequency and monetary values individually for each customer. Five is the best/highest value, and one is the lowest/worst value. A final RFM score is calculated simply by combining individual RFM score numbers. Remember, RFM values and RFM scores are different. Value is the actual value of R/F/M for that customer, while Score is a number from 1-5 based on the value. Look at the table below. To calculate score, we first sort values in descending order (from highest to lowest). Since we have 15 customers and five scores, we assign a score of five to first three records, four to next three and so on. For overall RFM score, we simply combine R, F and M score of the customer to create a three digit number. Note: The most recent purchases are considered better and hence assigned higher score. Thus, customers who purchased recently, are frequent buyers and spend a lot are assigned score of 555 – Recency(R) – 5, Frequency(F) – 5, Monetary(M) – 5. They are your best customers. Alexander Diesel in this case, not Ammar Fahad – the highest spender. On the other extreme are customers spending the lowest, making hardly any purchase and that too a long time ago – a score of 111. Recency(R) – 1, Frequency(F) – 1, Monetary(M) – 1. Andy Smith in this case. Now let me quickly explain why we made groups of three for each score. How to calculate RFM score on scale of 1-5? Different businesses may use different methods of rfm formulas for ranking the RFM values on the scale of 1 to 5. But here are two most common methods. If someone bought within last 24 hours, assign them 5. In last 3 days, score them 4. Assign 3 if they bought within current month, 2 for last six months and 1 for everyone else. As you can see, we’ve defined a range for each score ourselves. Range thresholds are based on the nature of business. You’d define ranges for frequency and monetary values like this too. This scoring method depends on the individual businesses – since they decide what range they consider ideal for recency, frequency and monetary values. But there are challenges with such fixed period / range calculation for RFM scores. As the business grows, score ranges may need frequent adjustments. If you have a recurring payment business, but with different payment terms – monthly, annual etc – the calculations go wrong. Recall your school days. There was a term – Percentile in maths. Percentile is simply the percentage of values that fall at or below a certain observation. Quintiles are like percentile, but instead of dividing the data in 100 parts, we divide it in 5 equal parts. If you understand percentiles, it’s easier to understand quintiles. If we make five equal ranges of percentile, a percentile score of 18 will fall in the 0-20 range, which would be 1st quintile. A percentile value 81 will fall in the 80-100 range, and hence 5th quintile. This method involves slightly complicated math, but solves a lot of problems in fixed range method. Quintiles work with any industry since ranges are picked from data itself, they distribute customers evenly and does not have cross overs. Quintiles is our recommended method to calculate RFM score. We use quintiles for creating RFM segmentations in Putler – our business analytics and marketing insight solution for online merchants. Take your customer data, give a score from 1-5 to R, F and M values. Using quintiles works best since it works for all businesses and adjusts according to your data. A graphical representation of RFM will help you and other decision makers understand your organization’s RFM analysis better. R, F and M have scores from 1-5, there are a total of 5x5x5 = 125 combinations of RFM value. Three dimensions of R, F and M can be best plotted on a 3D chart. If we were to look at how many customers do we have for each RFM value, we’d have to look at 125 points of data. But working with 3D charts on paper or a computer screen is not going to work. We need something in two dimensions, something easier to depict and understand. In this approach, we plot frequency + monetary score on Y-axis (range of 0 to 5) and recency (range of 0 to 5) on X-axis. This reduces possible combinations from 125 to 50. Combining F and M into one makes sense because both are related to how much the customer is buying. R on the other axis gives us quick peek into re-engagement levels with customer. Consider a subscription business for example. For a customer with monthly subscription of $100, their monetary value will be $1200 for the full year, but frequency will be 12 owing to monthly billing. On the other hand, a non-recurring business, or annual subscription at $1200 indicates good monetary value but frequency is only 1 due to single purchase. The customer is equally important in both cases. And our approach of combining frequency and monetary scores gives them equal importance in our RFM analysis. Understanding 50 elements can still be tedious. So we can summarize our analysis into 11 segments to understand our customers better. If you recall, we discussed these segments at the beginning of this article. Here’s a table that explains how you can create 11 customer segments based on RFM scores. Giving a distinct color to each segment will allow easier recall. And if we select colors for wisely, our pictorial representation of RFM will be much easier to share and understand. So here’s our final RFM summary report! Color coded RFM reporting FTW! With increasing focus on customer relationship management (CRM), RFM has become an integral part of marketing and business analytics. If you are doing one-off evaluation of your customers’ shopping behavior, you can get away with performing a manual or semi-automated RFM analysis. But if you have a slightly large database, you don’t want to do all the complex calculations yourself. Bruce Hardie and Peter Fader wrote a detailed note about using Excel to calculate RFM scores. They also have a sample Excel file that you can use. But this note is from 2008 and may need updates. There is also an Excel template from UMacs Business Solutions that sells for $3.99. There is a walkthrough for setting up RFM calculations using Excel on CogniView’s site as well. There are many CRM software that can automatically calculate RFM scores and segment your customers. Check with the CRM of your choice if they already have RFM support. R and Python are popular for statistical and business analytics. If you have your own data science team, it would be best to create a custom RFM model for your business using your existing tools. RetentionGrid is a software service specialized in RFM analysis. It can bring in data from your Shopify, BigCommerce or TicTail store and show beautiful visualization of RFM segments. Putler provides comprehensive RFM analysis, and gives you many other business analytics and reporting tools. It’s built for e-commerce and supports automatic sync with major payment gateways and e-commerce systems. Putler also gives you detailed reports on a whole lot of other things – sales, products and visitors. RFM analysis in Putler is available in the customer dashboard. Here’s how it looks. Putler offers a free 14 days trial. You can connect different data sources to Putler and get complete RFM segmentation done for free! RFM is a simple framework to quantify customer behaviour. Many people have extended the RFM segmentation model and created variations. RFD (Recency, Frequency, Duration) – Duration here is time spent. Particularly useful while analyzing consumer behaviour of viewership/readership/surfing oriented products. RFE (Recency, Frequency, Engagement) – Engagement can be a composite value based on time spent on page, pages per visit, bounce rate, social media engagement etc. Particularly useful for online businesses. You can perform RFM for your entire customer base, or just a subset. For example, you may first segment customers based on geographical area or other demographics, and then by RFM for historical, transaction based behaviour segments. Our recommendation: start with something simple, experiment, and build on. Marketers have used RFM based segmentation to optimize their return on investment on marketing campaigns for years. This is typically done by sending targeted messages to those 11 segments we discussed earlier – or any other custom segmentation that situation demands. Customers / User segmentation isn’t something that is alien in the marketing world. The big brands have this down to a T, and the little guys are just waking up to the power behind having a laser-focused strategy – laser-focused on user segmentation. Create segmented lists in your email marketing software (MailChimp, Campaign Monitor etc) from RFM analysis. Then run an automatic drip campaign on each segment. If possible, automate moving people between segmented lists as they move from one RFM segment to another. You can further segment based on open and click rates, and products purchased. This gives you laser focused, highly relevant market segments. This strategy drastically improves results. How much a customer spends with you during her lifetime is based on a number of factors. RFM can assist in many of those aspects – reducing churn, offering upsells and cross-sells to segments that are more likely to respond, increasing loyalty and referrals, selling high ticket items and more. One word of caution though. Do not go overboard. If you keep sending marketing campaigns to one segment of your customers, they may get irritated and stop buying. Promoting new products to loyal customers is a great way for getting initial traction and feedback. You can contact your Champions and Loyal Customers even before building a product. They can provide you great insights into what to build and how to promote it. This group of people will also happily refer your product to their circles of influence. If you run a loyalty program, Potential Loyalist is the first segment you may target. You want to make sure their initial experience with your product and service is pleasant and memorable. Follow up with a few timely promotions and they are highly likely to buy again. Sending educational content to these customers will also increase their engagement with your brand. At Risk and Hibernating are two segments that you need to pay special attention to. Send personalized emails or call to reconnect with these customers. You may even offer repeat purchases at a discount or run surveys to address their concerns before you lose them to competitors/alternatives. RFM analysis helps your business: better email marketing, higher customer lifetime value, successful new product launches, outstanding user engagement and loyalty, lower churn rate, better RoI on marketing campaigns, success in remarketing, a better understanding of your business, overall higher profits and lower costs. Un-targeted marketing campaigns can be expensive. Focusing on a smaller segment of customers will significantly reduce costs, allow you to do more experimentation, and make decisions based on data. As a matter of fact, the roots of RFM are in direct marketing. Where they reduced costs of printing and shipping catalogs by targeting only those customers that were more likely to respond to these campaigns. So whether you are doing digital marketing, print or media, segmentation will reduce your costs and improve return on investment. Remarketing is a smart technique where you show your ads / promotions to people who’ve been to your site at least once – but are now on some other site. They will see your ads on the other sites they visit – this improves click rates and overall effectiveness. A simple way to use remarketing with RFM can be to export a segment of your customers – especially the Recent Customers or Promising ones – to Facebook Audiences or other campaign management solution you are using. Then show promotions to that group of people. Most small businesses do not fully understand their customers. They may not know their customer demographics or firmographics. Collecting and understanding this information can also be time consuming and costly. RFM analysis becomes a quick method to understand your customers’ behavior. And since it is based on actual transaction history, it’s much higher quality. Looking at different RFM segments can reveal insights about your own business. Asking questions about how your segments compare to each other can open up huge opportunities of growth. How will you use RFM model? What can you improve in your business with much better understanding of your customers? Can you send handwritten thank you notes to your best customers? How about sending discount coupons to people who are not spending enough? Can you afford to disregard lost customers? How can you tie this back to your own systems? RFM technique is a proven marketing model that helps retailers and e-commerce businesses maximize the return on their marketing investments. RFM is a historical analysis. It is not for prospects. Then go to Customers dashboard to see RFM and other analytics in action. Or sign up for a free trial to see your own RFM segmentation. Leave a reply with your comments or questions. And don’t forget to share this article with fellow marketers. Data Mining Using RFM – an excerpt from a book by Derya Birant and Prof. Kimito Funatsu. Great article. A question on the graphic for the ultimate final rfm report – if customers are split into quartiles, why is there different numbers of customers in each “group” (eg “can’t lose them” has 68 customers and “at risk” has 1300 or so) ? Thanks for the appreciation. Based on percentile values of customers, the customer database is divided into eleven different segments. As “Can’t Lose Them” and “At Risk” are completely different segments, the number of customers falling into each of them will also be different. However, could you explain a little bit further for me the way that you divide 11 segments? Isn’t it overlapped, the champions & loyal customers? I also wonder why the segment are overlapping. Did you get any answer? Yes, I also want the answer. Without this issue being solved, this 11 segmentation is impractical. I have replied to the same question asked by Anh Hoang Duc and Lars above. Have a look. Hope it clears your doubt. If you consider the part of Loyal Customers segment having recency score from 4-5 on the X-axis (horizontal), the frequency + monetary score on the Y-axis (vertical) doesn’t exceed 4. Similarly, the part of Loyal Customers segment having the frequency + monetary score from 3-5 on the Y-axis doesn’t exceed the recency score of 4 on the X-axis. Hence, only the customers having the highest RFM scores from 4-5 fall into the Champions segment. As a result, the segments don’t overlap and when you view your customer’s data into Putler, you will see different customers in Loyal Customers segment and Champions segment respectively. Thanks for the great Article, really helped a lot in understanding customer segmentation. I have troubles with the practicality of the segmentation of few combinations. Am I only not seeing it, or is there no Segment for RFM Scores like 414,352,324 etc? The segments don`t seem to cover all cases. Or after minutes of looking I just don’t see the fitting segment. Can you help? Great article! but how do you combine Frequency & Monetary Score Range? You say “frequency + monetary score on X-axis (range of 0 to 10) “, but in 11 segment table we didn’t see any score greater than 5. Could you explain your approach? So we can understand well. Thank you for such great article. I have one question about the quintile method. should it be done on the population number or it should be done on the RFM values. I mean if it is the second, the population get differ in size. Thanks for the appreciation Sirvan. Yes, the quintile method is applied on the population number. Hi there, great article. But instead of trying to explain the score and segmentation, can you write it down for us exactly which score belongs to which segment? That would be very helpful, and it’s only about 120 combinations so I don’t think it’s such a big deal. Writing 120 combinations isn’t a big deal. But segmenting users into these 120 combinations itself is very messy, confusing and prone to errors. Hence, to avoid that, we made the RFM analysis to give users readymade customer segments so that they can easily target their audiences accordingly. Thanks for the explanations. However, I still don’t understand how you combine Frequency & Monetary Score Range? You say “frequency + monetary score on X-axis (range of 0 to 10) “, but in 11 segment table we didn’t see any score greater than 5. Also , does the 11 segments cover everyone or there are other customers that are left out? The horizontal axis, X-axis corresponds to the Recency score. The vertical axis, Y-axis indicates Frequency + Monetary score combined. Both these axes range from RFM scores 0 to 5. And based on these RFM scores, 11 different customer segments are generated. So, no customer will be left out. Refer this for more details -https://www.putler.com/rfm-analysis/#visuals.